Personal zines put health conditions back in the hands of the people who experience them. For International Zine Library Day, here are six that we love. 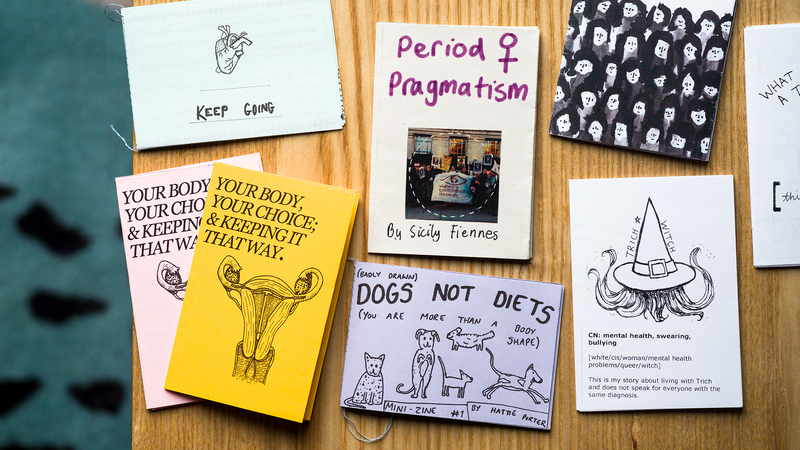 Like people and their health, zines come in all shapes and sizes. Among these tactile, unofficial and informal publications (‘zine’ is short for ‘fanzine’ or ‘magazine’), sometimes the smallest and most inconspicuous-looking ones explore the biggest topics. Just six passion-filled pages can concisely communicate the culture, politics and lived experience of the human condition. From a long-standing but still-thriving scene of self-published pamphlets and booklets, a new sub-genre has emerged: autobiographical perzines (or personal zines) give us alternative narratives of physical and mental health, focussing on human-centred issues, emotions, and experiences. While many of us would naturally turn to official medical resources or literature when we want to know more about a condition that affects us or people that we love, zines give an inclusive and personal approach, abandoning the jargon of health practitioners for a perspective that puts illness and treatment back in the hands of the people experiencing it. The creators may not be health professionals, but they are experts in their own bodies and experiences, able to identify gaps or absences in mainstream advice and support. The DIY tradition of zine-making offers the opportunity to produce and distribute information and first-hand accounts easily and cheaply, leapfrogging the glossy, edited and distanced input of official publications. Pocket-sized zines, in particular, offer an intimate reading experience, through their handmade production values, and open, honest and accessible writing. They are the small but mighty placard voicing the thoughts and feelings of the individual who needs to speak out about their own experiences, and offer comfort, support and inclusion to others who may be experiencing the same. Wellcome Library has been collecting zines as part of our growing graphic medicine collection, and for Zine Library Day today we’ve selected a handful of the tiniest zines that explore big issues in meaningful ways. Unassuming and discreet in style, perhaps with intention, this mini-zine contains a secret. Like reading a very raw diary entry, this zine reveals the embarrassment, humiliation and shame the creator feels living with the obsessive hair-pulling disorder, trichotillomania. The disorder is common, but often difficult to diagnose, but this zine is an honest attempt at destigmatising some of these behaviours so others can identify with them. What not to say to a Type I diabetic… Ever! by Charlie L.
What not to say to a Type I diabetic… Ever! Humour is often used as coping or connecting mechanism to ease tension and get people to open up and communicate about issues that may be painful, taboo or awkward. This zine is a great example of how humour can be employed to challenge our preconceptions about illness, and speak out against discrimination towards those with (in)visible illnesses or disabilities. Carefully crafted, these tiny hand-sewn zines are perfect for keeping in a wallet or pocket, for a daily prompt of self-care, or slipped into an envelope to send to a friend who might need a little help in understanding struggles with mental health. Unlike other mental health zines that are very personal diary-like streams of consciousness, these give practical and practicable mental health advice (one even includes an insert with helplines and recognised resources). Zines have been used as a vehicle for activism for decades, so it’s unsurprising that, however tiny, they continue to shout to the rafters about huge global issues succinctly and powerfully. Topics such as LGBTQ+, disability and women’s rights, racial equality and health care reform (to name a few) have all been given a platform, as well as menstrual activism and global environmental issues. This tiny zine combines the latter two, informing women about sustainable alternatives to help reduce sanitary waste, and overcoming social taboos by encouraging women to talk about menstruation more. Some zines require very few words to get their message across, and this mini-zine packs a visual punch. Earlier this year on International Women’s Day Philip Kennedy put out a zine to highlight the number of Irish women who travel to the U.K. every month for an abortion. Digitally distributed, the zine is free, and can be downloaded, printed and physically shared to raise awareness of the repeal the 8th campaign. Your body, your choice; & keeping it that way. In the United States, activism forcefully re-entered the mainstream in the wake of Donald Trump’s inauguration and subsequent attacks on women’s health through funding cuts to reproductive health and education services. Repro Rights Zine, another free and open resource, was born to educate all people (women, trans and non-binary) on their reproductive rights, and the health services currently available in the US and those under threat. Distributing the zine freely is part of the revolution to inform and empower the disadvantaged, because, in their own words: “information is power, and using your voice to take ownership of the things you care about is a radical act”. Help us collect more zines! Wellcome Library has a growing graphic medicine collection, and is now collecting zines focussed broadly around themes of health (both physical and mental), medicine and the human condition. If you’ve made a zine that you think would complement our collection and would like to donate a copy, please contact Nicola Cook or Loesja Vigour (libraryacquisitions@wellcome.ac.uk). Follow us on social media to get updates on the collection’s development too! Nicola Cook (@nicololosaurus) is a Librarian, and is interested in diversifying the voices and perspectives of health in our library collection. When she’s not cataloguing, she can be found discussing curious cures in the Reading Room or trawling the web for new zines. Loesja Vigour (@loesjavigour) is a Librarian who spends her time cataloguing and instagramming books for @wellcomelibrary. She is interested in seeking new and diverse audiences for the collections by engaging them with unique, beautiful, and thought-provoking content. She loves zines, children’s books, and Ant and Dec.